Hold on to your hat! 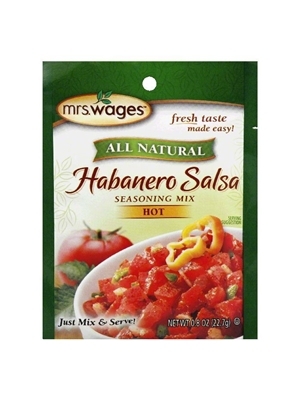 Real habanero chilies team up with plenty of onion, bell peppers and classic southwestern spices to create a fiery hot salsa seasoning in Mrs. Wages Habanero Salsa Seasoning Mix Hot. .8oz. Dehydrated Vegetables (Onion, Chili Pepper, Green Bell Pepper, Garlic, Jalapeno Pepper, Habanero Pepper), Maltodextrin, Salt, Spices, Dextrose, Natural Flavor.